Prior to 1980 Mike Bach has always had an eye for America’s classic cars. From Hot Rods to Classic Cruisers, Mike Bach and his family run Auto Body Repair Team have grown a hobby into a separate division for his Company. From saving American automobiles to working with soda machines, gas pumps, and other miscellaneous treasures his artistic team can bring many old treasures back to their original quality! 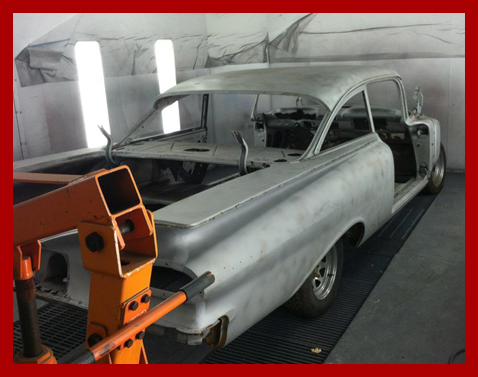 Every restoration project is a custom job and all our custom jobs can fluctuate in pricing as we get into the project. Your finished piece will look brand new when our team completes your classic restoration. Please realize that we will make your vintage items look great on the outside but we cannot spend the time to have your internal mechanics working. We are an excellent Body Shop! Mike Bach Auto Body, Inc.